Today it feels like fall on the east coast. The Philadelphia weather on Wednesday reminded me of September heat-waves in California (when I made this lemonade), but today, apparently, fall is here. In September I braved the weekend heat to pick apples at Linvilla Orchard and, as usual, I bought lots. So I went through my “to make” list in search of apple recipes and saw this recipe for “fine pippen Tarts” from UPenn MS Codex 785. (I’ve cooked from this manuscript a lot: check out our new manuscript and library tags to see what archives we’ve been cooking.) It took me a little while to get into the kitchen to try this recipe (the heat, the big talk I gave, grading), but these pippin tarts are truly fine. Recently, my “to make” list has been a decidedly mixed bag. I started to make this Cordial Pepper Water and I had so much trouble with the poppy infusion that I’m not sure if a recipe will ever make it to this site. (I have a half bottle of very, very poppy-flavored brandy sitting on my kitchen rack right now.) On the other hand, I started working on some holiday recipes. I’m excited to share these mince pies with you soon. In the meantime, I think we should eat and talk about delicious apples. They’re sharp, crisp, floral, sweet, and sometimes even savory. My farmer’s market has a wide range on offer. So does Linvilla Orchard a half hour away. But yesterday I took a ride to the Brandywine valley and found some apples that are a bit closer to British pippins at North Star Orchard. These Rubinette apples are similar to the classic variety Cox’s Orange Pippin. Eaten raw, these are dense and fragrant. It seemed like a shame to cook them so I saved a few to snack on throughout the week. Luckily, cooking only enhanced these natural qualities. 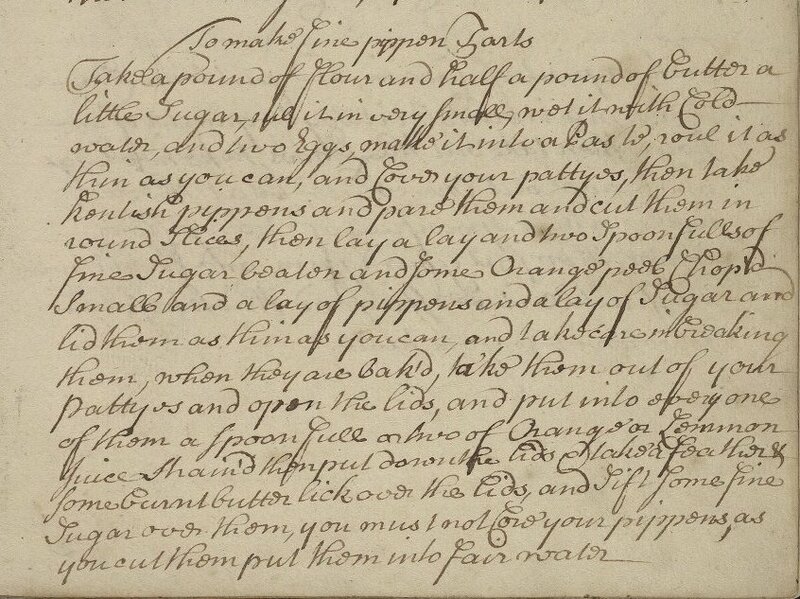 This recipe delights me in a few ways: pippins, the use of fresh orange peel and juice, a feather pastry brush, and a very tasty pastry recipe. I’m also curious about the moniker “henlish pippens” to describe this apple variety. Anyone out there have any ideas? *Halved from the original, this recipe makes 12+ small tarts. Make the pastry. Put the flour, sugar, and salt in a large bowl. Stir to combine. Chop the butter into small pieces. Work the butter into the flour mix until a fine meal forms. Add the egg. Add the water one tablespoon at a time. Using your hands and/or a spoon, work the mix until it holds its shape as a ball. It will still feel dry to the touch. While the pastry rests in the fridge or at a cool room temperature, peel, core, and slice the apples into rounds. Roll out the pastry. Using a pastry cutter or drinking glass, cut circles. I used a 2 5/8 in (68 mm) pastry cutter to make nice little tarts. Make sure you have an even number of circles so that you have bottoms and lids. Fill each pie with apple rings. Given the proportions of my mince pie pans, I ended up breaking my rings a bit. Season each tart with 1/4 t sugar and grated orange zest. Place a lid on each pie. Push down the edges of the pastry to seal. Poke a few air-holes in the lid with with a fork. While the pies are baking, let 1 T butter sizzle to a golden brown in a small sauce pan. When the pies are out of the oven and on a cooling rack, open the lids with a butter knife and pour 1/4 t orange juice into each pie. Replace the tops and brush with brown butter. Delicious pure-apple flavor beautifully enhanced with citrus. Although I love my classic apple pie with cinnamon, nutmeg, lemon juice, and a handful of cranberries (my mother’s genius addition), this recipe is a beautiful combination of flavors. I think the orange brought out the floral notes and acidic sharpness of the pippins. I tried the tarts with and without the additional orange juice and prefer them without. (My spouse Joseph liked the orange juice flavored tarts better.) Feel free to add the juice or leave it out. On the other hand, the brown butter glaze added a fabulous, nutty note so don’t skip it. The pastry was also delicious on its own. I’ll definitely be making it again when I come across recipes that simply request pastry, but don’t provide specifics. This one is delicious and as easy to make as my modern go-to. Finally, this would make a lovely large pie instead of individual tarts. This would save you a lot of prep time and allow you to really layer the rings (which my pan did not allow). Whether you can find pippins or not, whether you’ve picked too many apples at an orchard or are excited to see them in your supermarket, let us know if you try this perfect fall recipe. ← Sorrell with Eggs – For a Plate. Could it be Kentish pippins? Quite possibly! Another reader suggested that on Facebook.